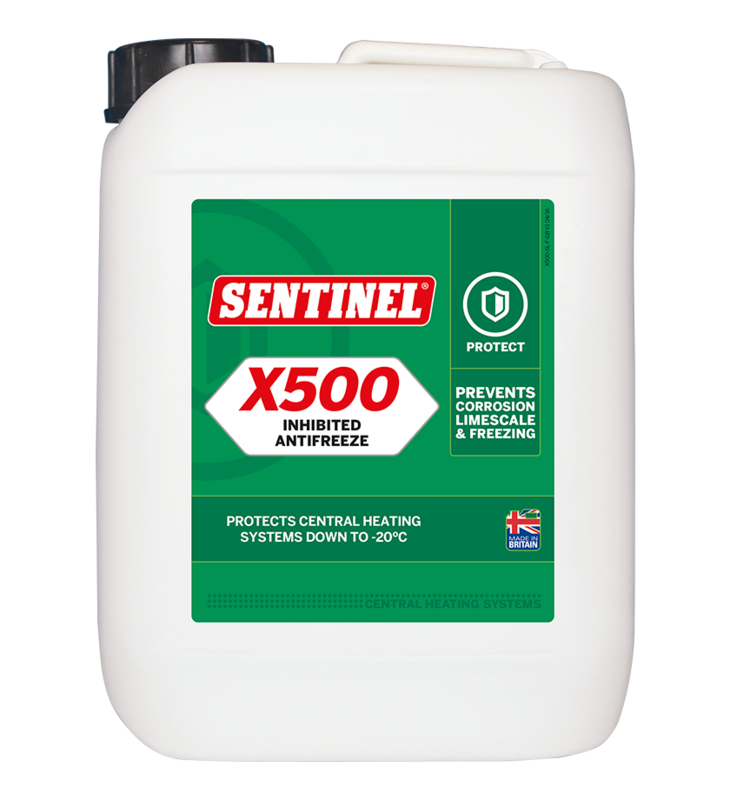 Ideal for properties vulnerable to sub-zero temperatures, Sentinel X500 Inhibited Antifreeze provides protection against limescale, corrosion and freezing. It protects all system metals against corrosion using the same unique blend of inhibitors as Sentinel X100 Inhibitor, but has the added benefit of protecting system water against freezing when temperatures are low. Limescale and corrosion are the two main causes of central heating inefficiency, leading to radiator cold spots, boiler inefficiency, a noisy system and a multitude of other problems. Once a system has been prepared using one of the cleaners from the Sentinel cleaning range, it should be protected with a Sentinel inhibitor to prevent the occurrence of limescale build up or corrosion. For properties which are vulnerable to low or sub-zero temperatures, or perhaps are uninhabited during the winter months, it makes sense to use an inhibitor with central heating antifreeze such as Sentinel X500, rather than the traditional Sentinel X100 Inhibitor. Using the same unique blend of heavy-duty specialist corrosion inhibitors, Sentinel X500 Inhibited Antifreeze protects all system metals against corrosion, but provides the added protection against low temperatures. 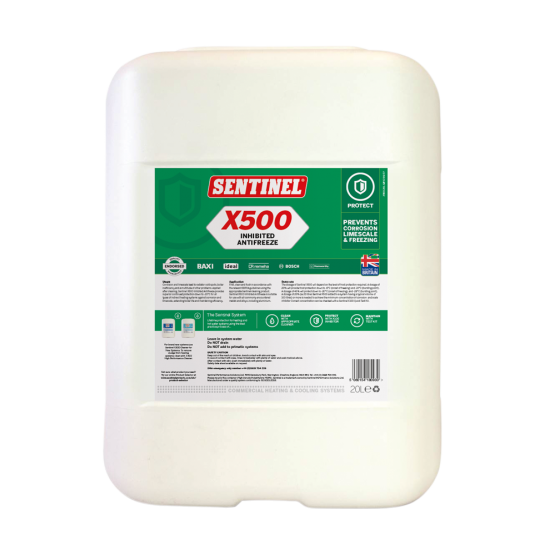 The dosage of Sentinel X500 inhibited antifreeze will depend on the level of frost protection required. 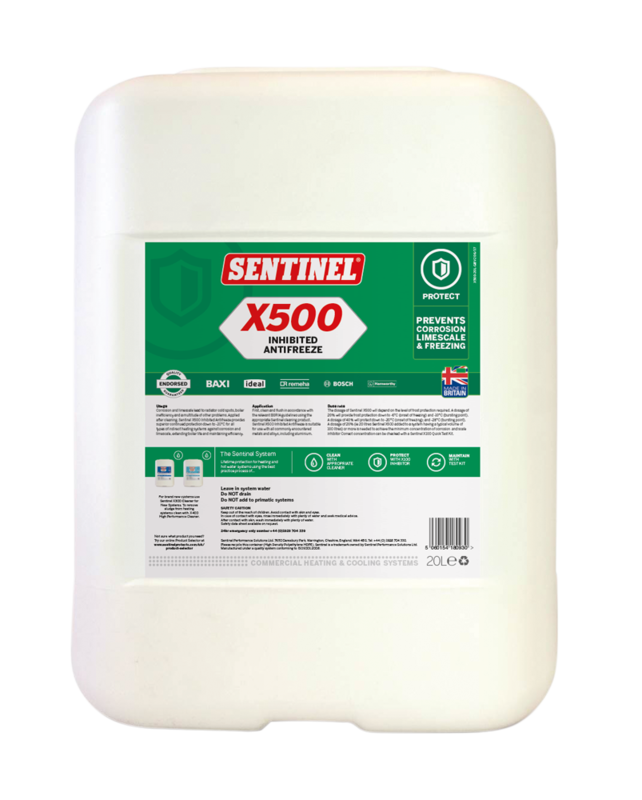 20L of Sentinel X500 antifreeze added to a typical domestic system up to 10 radiators will provide the minimum concentration of corrosion and scale inhibitor and also protection from freezing down to approximately -6°C. 40L will provide protection to -20°C. Can Sentinel X500 Inhibited Antifreeze be used in systems with aluminium components? Can Sentinel X500 Inhibited Antifreeze be used in systems with plastic pipework? How do I get Sentinel X500 Inhibited Antifreeze into a system? How does Sentinel X500 Inhibited Antifreeze work? The system in question is over 20 years old; is it safe to use Sentinel X500 Inhibited Antifreeze? There is already Sentinel X500 Inhibited Antifreeze in the system; can it be topped up? What are the next steps after using Sentinel X500 Inhibited Antifreeze? 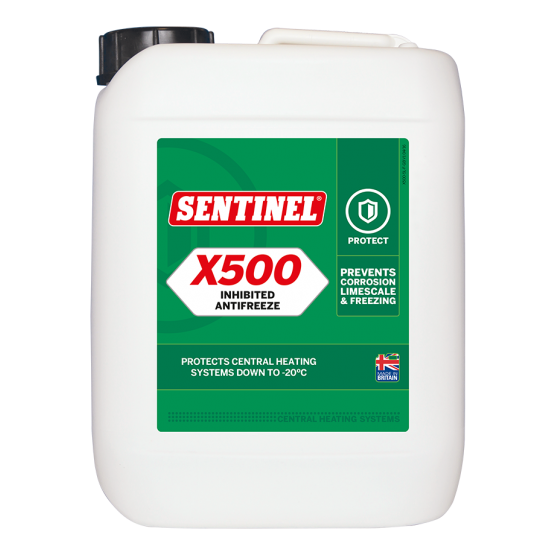 What does Sentinel X500 Inhibited Antifreeze do? What is the dosage rate of Sentinel X500 Inhibited Antifreeze? What problem does Sentinel X500 Inhibited Antifreeze address? When should I use Sentinel X500 Inhibited Antifreeze?